Thing 1 & Thing 2 had their first “real” Jack-O-Lantern carving experience this year. Although we did some the last couple of years, this is the first time they chose their own designs & helped in the carving. They both wanted “spooky, spooky” classic Jack-o-Lanterns with one with triangle eyes and one with circle eyes. So cute! Here they are in their girly tutu Thing 1 & Thing 2 outfits. We did have a slight hiccup, though. One of the pumpkins started molding immediately. With two little ones wanting to enjoy them, I had to fix that. 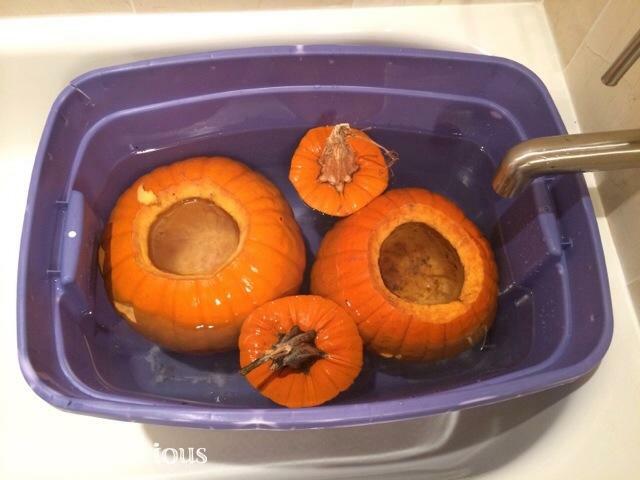 I soaked them in diluted bleach to clean them and kill the mold. I meant to soak them in diluted vinegar right after carving to help them last (I do this with our berries with great success), but life happened and it just got away from me. Next year, I’ll be sure to have this ready to do right after carving!